Part 1: Don't do any extra work until the the last lap. We had 71 people on the start line so it was the bigger race of the year. 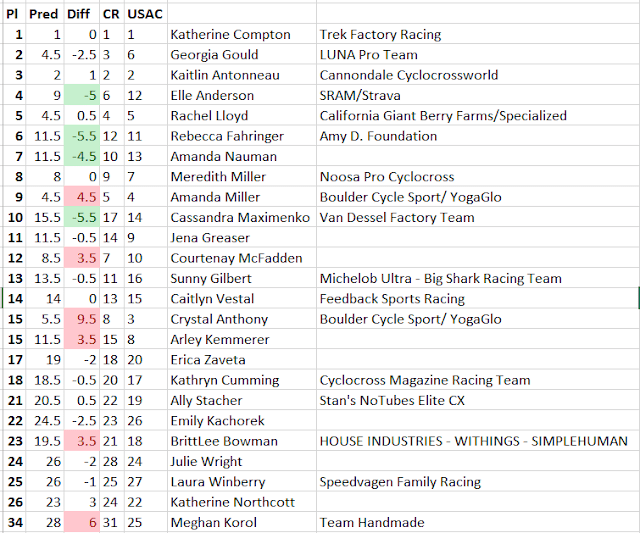 I got away pretty cleanly, slotting in around 8th, but the lead group was larger than usual and I think 12 or so people made the first cut. Furthermore, Bret Bedard didn't wax his skis and it was 34 after a high of 40 -- for two laps he tried to break away but the superior (expensive) glide of the chasing pack hauled him back on the downhills. This ended up making the pace a lot higher than last week since we were actively chasing him down the hills instead of standing around looking at each other. Basically, after 3 laps of trying to do minimal work, I felt like I had done a ton of work just to hang on, and Part 2 of the plan didn't seem like a very good idea. Can you say SNOW RIDE?? This Saturday it was time to reverse the trend of driving South to Otis on weekends to head north to Jackson for winter is actually supposed to be about: ski racing. This may come as a surprise to those of you that think winter is about getting fat or riding trainers (if not both), but there is in fact a tasty alternative to sweating indoors. Unfortunately it requires the cooperation of Mother Nature and decades of technique work, but that's your problem, not mine. Last night found me back at Weston for another round of crit skiing, er, ski drafting, er, short track nordic, er... whatever. A flat ski race with lots of drafting. This time around we had Bret Bedard in the mix, a guy who looked like he might be the next (the first?) great American skier when he was in High School. Why he's in Boston, I have no idea, but it was basically a race for second place with him there. Alex is off orienteering around Europe so I've been borrowing her Garmin 305 as part of my top-secret Otis mapping project. I've ridden at this place 5 times in my life now (3 in the last 2 weeks) and I'm still lost most of the time. It's easy to know what general area you're in but impossible to know exactly what trail you're on or how to get from point A to point B -- every trail winds around ridges and back on itself so much that covering 500 yards in a straight line can end up taking a mile of riding. In other words, Otis freaking rocks, except when you're lost and the sun is going down. What you see above is about 4 hours of riding -- the blue line and the red line are from two different two hour rides Linnea and I did this week. 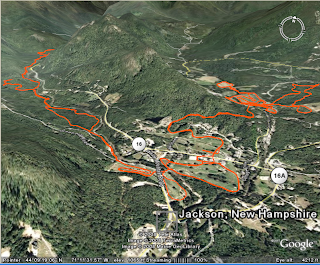 The red line basically follows the perimeter, but everything inside it is an insane network of smooth singletrack. Now that the season's over, I've seen a few "what was your favorite course?" discussions go flying across the internet. These are generally pretty silly because part of what makes cross sweet is how every course is different. Nevertheless, the offseason is the time for silly discussions -- so I shall make a contribution. At least for me, racing a new course each week is better than racing my favorite course twice in a season -- so the answer to "what was your favorite course" is probably the last race I didn't do horribly at. Breaking races down to "best" or "favorite" just isn't descriptive enough for me, anyway. Without further ado, allow me to present the 2007 Golden Top Mount Awards. Despite four days of 60 degree weather, Weston Ski Track still had over a foot of ice, err, packed snow, so the CSU Sprints were still on for Sunday. 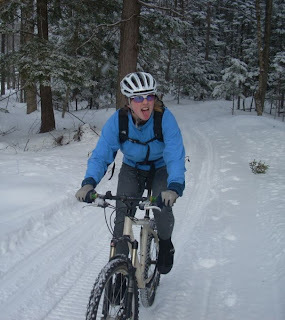 Unfortunately, watching all the snow around my house melt had cured me of much motivation to ski race, so Linnea and I went mountain biking down at Otis Air Force Base (the best winter riding location in Massachusetts) and then up to the legendary Zank party. This was notable for a few reasons. First of all, it's a great set of excuses for not skiing very fast on Sunday. Long mountain bike ride followed by coffee followed by beer followed by getting home at 1 AM? You can't expect a guy to ski fast after that, right? Secondly, I met a lot of people who I only previously knew as e-quaintances. After about 20 minutes I just started introducing myself as the crossresults.com guy, which spared folks the trouble of having to act like they knew who I was. Sigh... another dreary day in Boston... to wet to ride and too warm to ski... well I might as well see what e-Richie's opinion is saying today. bunch of links... hmm what's this one? Most Tuesday nights during this season formerly known as winter CSU runs a 5-10k race at Weston. Most Tuesday nights I attend. Last year I got beat down every Tuesday night, which rapidly became something not worth of blogging about. But this year is another year, right? Maybe I'm in better shape, maybe I'm not -- but either way, all the master blasters are a year older. Advantage: Colin. 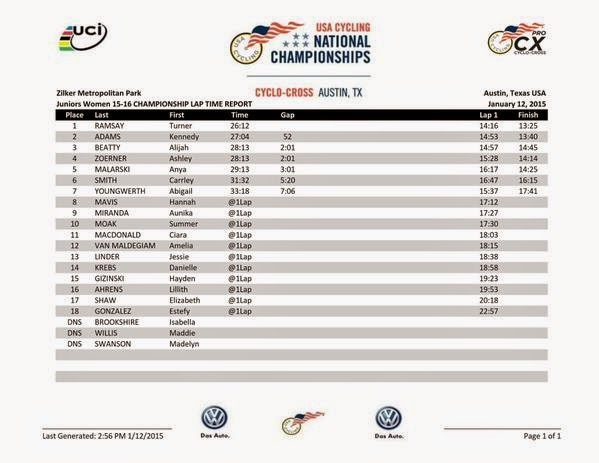 Sadly I did a little research on what my elderly opponents were up to and it seems that while I was bike racing they were doing time trials at Mont Sainte Anne. Advantage: Master Blasters. The fact that it's January and I'm doing more cross races instead of nordic skiing makes it harder and harder to take myself seriously as a ski racer. But on the other hand, who gives a crap, racing is fun and worth writing about. The alternative would be training reports and race recaps like "It was an individual start and I got beat by a 14-year old." And no one needs that. Anyway the nordic career will get underway tomorrow night with Tuesday Night Smackdown at Weston (in 50 degree weather...) and then some sprints next weekend. In the meanwhile, though, it was down to Dayville for the second time this season, racing on basically the same course except with snow added. The snow caused just one dismount per lap thanks to some shoveling, but there was a lot of soft corn snow (it was 45 degrees) to plow through and lap times were 1-2 minutes slower than the first race. There's a cross race down in Connecticut this weekend. I'm going, because I like racing bikes, even if I haven't ridden in three weeks. The weather looks like perfect cross weather. Recently melted snow should make for perfect cross conditions. Tim Johnson would barehand it. So what's it going to be, anonymous blog reader? Want to go race bikes? It's fun, remember? I don't want to hear about how much you ate over the holidays. I don't want to hear about how long you've been off the bike. I don't want to hear about how you cleaned and put away your bike. Cross racing is fun. Whatever else you were going to do Sunday is not as fun. Thus, you should cross race. QED, pussies. 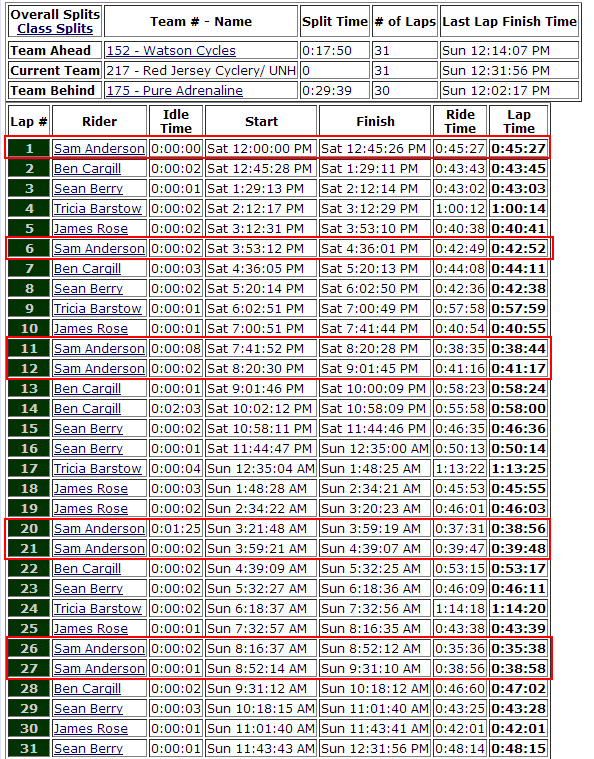 Apparently VeloNews has quite a bit of pull, even on New Year's Day.